I bought a whole mess of greens at USGM this weekend. 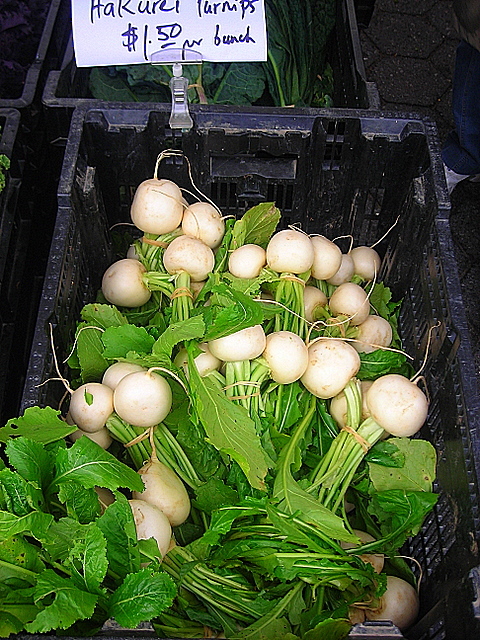 Turnip greens, French breakfast radishes, radish greens, mustard greens and spinach. In addition, I have some leftover baby bok choy. Got any ideas? I have some leftover Rancho Gordo borlotti beans. I figure that’s probably good for a bean stew, along the lines of the broccoli rabe from a couple weeks ago. I’m playing around with the idea of mustard greens tossed with some onion confit and bacon ends. There’s a warm salad of turnip greens, Bintje potatoes and Italian sausage. Maybe a vegetable plate for dinner on Friday night. I’m curious to see what some of you might think of. 19 May	This entry was published on May 19, 2009 at 12:01 am. It’s filed under food, general, spring and tagged beans, cooking, dinner, greens, ideas, potatoes, recipes, seasonal, vegetables. Bookmark the permalink. Follow any comments here with the RSS feed for this post. OH yes, sausage with all that green stuff! I love baby bok those first few times they show up FRESH…. You’ll be having a rich combination of things there… and I am embarrassed to admit, my lunch today cooling as I write is my old Mom’s southern classic: Smoked Hamhocks and Pinto Beans…that were soaked last night. They’ll be good since I haven’t had ’em in a while, but not delectable as your meal sounds. Yum.